Welcome baby girl! You are so tiny, cute and cuddly... Bless you and your new proud parents! This is such wonderful news! A brand new tiny little person has come. God bless the new life! Congratulations for holding a little treasure in your arms! May God bless you and your little one. Please let me know if there's anything I can do to help. I'm mighty pleased to know that god has gifted your family with a sweet angel. May new baby boy fills your lives with happiness and your hearts with love. 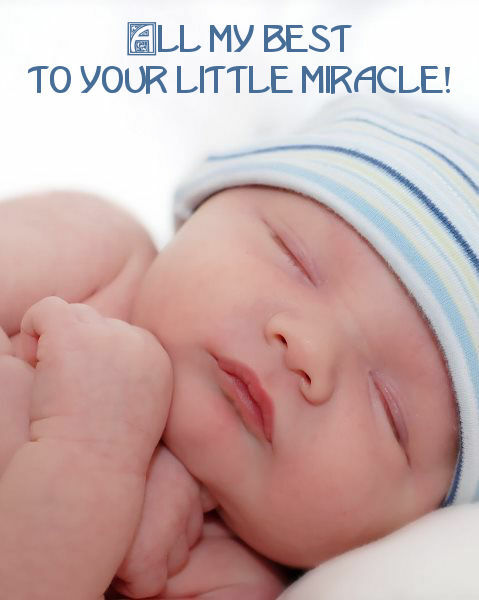 A tiny angel sent from above has come to fill your hearts with joy. May your life be filled with love and peace. You have been blessed with a precious gift from God - a child. Congratulations new parents! We're thinking of you during this exciting time. Congratulations on the birth of a new member in the family! May God's blessings be with you and your little one today and always. I congratulate you on such a happy and blessed occasion. Wishing you so many precious moments with your beautiful new baby. Congratulations to you and blessings to your new beautiful baby! Congratulations on the birth of a new member of the family! May God's blessings be with you and your little one today and always after.